Why simulation at a business school? aGPSS is the most modern version of GPSS, running on both Windows and the Macintosh. It is available on a USB, a CD, or downloadable from the Web. aGPSS is a streamlined version of GPSS, a General Purpose Simulation System. aGPSS is intended to be the starting point in learning simulation. It is used thus at many colleges and universities in Northern Europe, the US, Japan and India, at both business and engineering schools, and also in self-studies in over 60 other countries. aGPSS is regarded to have several advantages. One first constructs a block diagram by choosing building blocks from a symbol menu by the point-and-click method. 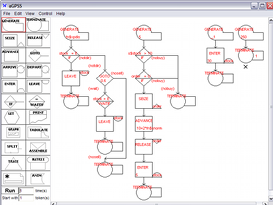 For each block symbol in this block diagram, one can then open a dialog for inputting the operands of the block. The dialog reveals the main syntax of the block operands. The text program developed in this way on the client computer is then executed by GPSS.EXE, the simulation engine used by aGPSS. The output files are then presented in tables, histograms and graphs. You can here free of charge download a demo version (limited to 50 blocks and 500 transactions). Download Windows demo version of aGPSS. Download Macintosh (OS X) demo version of aGPSS. There are several larger versions of aGPSS on sale, starting at the price of $40.00. You can read more information about this here. Instructions on installing aGPSS on your computer is given here. For the start of learning aGPSS we recommend the paper on The First Two Hours of Simulation Education. For continued studies of aGPSS, we recommend three aGPSS books.